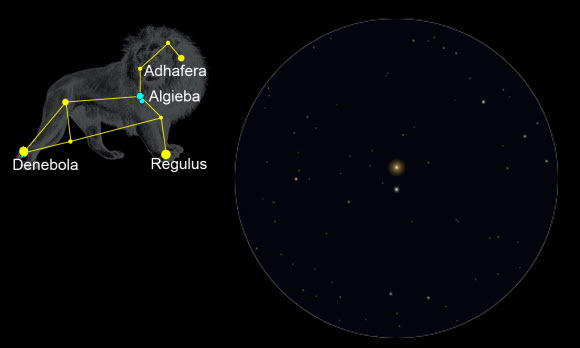 One of the finest double stars in the spring sky and it could be argued in all the heavens – is gamma (γ) Leonis, proper name, Algieba, from the Arabic Al Jabbah (The Lion’s Mane). Shining at mag +2.1 Algieba is comprised of magnitude 2.4 and 3.6 stars currently separated by 4.6 arc-seconds. They form a slowly widening binary system with an orbital period estimated at between 5 and 6 centuries. 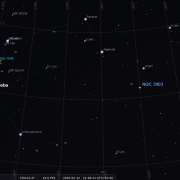 Algieba is located in the “Sickle” of Leo - the brightest star after Regulus. The pair is just about resolved in small-aperture telescopes with medium power, certainly a decent 100mm scope at 80X magnification should split them, and once split Algieba is quite striking, both components being rich golden-yellow in hue indicative of its K0 and G7 spectra. Some observers note a slight greenish tinge to the companion. At a distance of 131 light years, such giant pairings are rather unusual, Capella may be considered as a similar one. The orbital period is estimated to be around 510 years, the component stars separated on average by 170 Astronomical Units, more than four times the average distance of Pluto from the Sun. However due to the very high eccentricity, this could be anywhere between 26 and 313 AU apart. In 2010, astronomers announced the discovery of a giant planet orbiting the brighter giant, Gamma-1 (Gamma Leo A), with a minimum mass of 8.8 times that of Jupiter in an Earth-like orbit averaging 1.2 AU in size with a period of 1.2 years. Take your time when observing this stunning golden binary star system- it’s definitely worth it. Crosses the 180 degree meridian line on various dates and times during April – try 11th at 22:00h. Telescope required to split components. This unique object was discovered by William Herschel on December 31, 1788. It lies at distance of almost 300,000 lightyears from the centre of our galaxy, making it one of the most distant known globular clusters, nearly twice the distance of the Large Magellanic Cloud. American astronomer Harlow Shapley nicknamed it "The Intergalactic Tramp" believing it to have possibly broken away from the Milky Way, however, recent observations indicate Shapley hypothesis was incorrect and NGC 2419 is still gravitationally bound to the Milky Way, just moving in a highly eccentric orbit. At such a distance it's estimated it will take about 3 billion years to complete a single orbit around the centre of the galaxy. Although rather faint, NGC 2419 is probably one of the largest and intrinsically brightest known globulars, estimated to contain well over a million stars across a spatial diameter of 400 light-years, comparable in brightness to the spectacular Omega Centauri. NGC 2419 is positioned 7 degrees north and slightly east of Castor (α Gem - mag. +1.58), About 4 arc minutes west of NGC 2419 is a mag. +7.2 star with a double star of mag. +7.9 a few more arc minutes further west. NGC 2419 shines at magnitude +10.3 and has an apparent diameter of 5 arc minutes. It's a somewhat challenging target especially under light polluted skies. 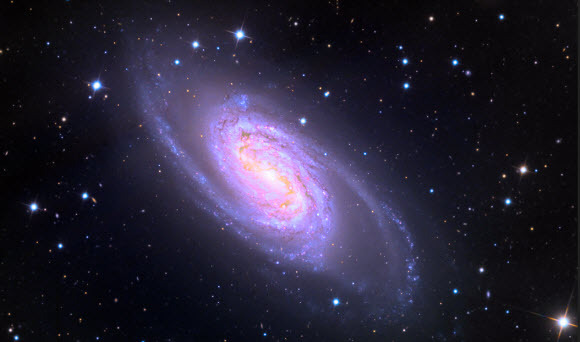 In good sky conditions it can be spotted with a small 100mm (4-inch) aperture, but a 150 mm (6-inch) scope is required to clearly reveal it as a small fuzzy object that's clearly non-stellar. Scopes in excess of 18” are needed to resolve its brightest stars. It crosses the meridian on the 14th at 22:00h. Discovered in 1785 by William Herchell below the belly of Hydra, this planetary nebula is often known as the Ghost of Jupiter due to its apparent similar angular size and hue to the planet when seen in the eyepiece. The “Ghost of Jupiter” really deserves at least as much attention as the more famous Ring Nebula in the constellation Lyra being at least 2 magnitudes brighter than the Ring at a relatively bright magnitude of 7.3. 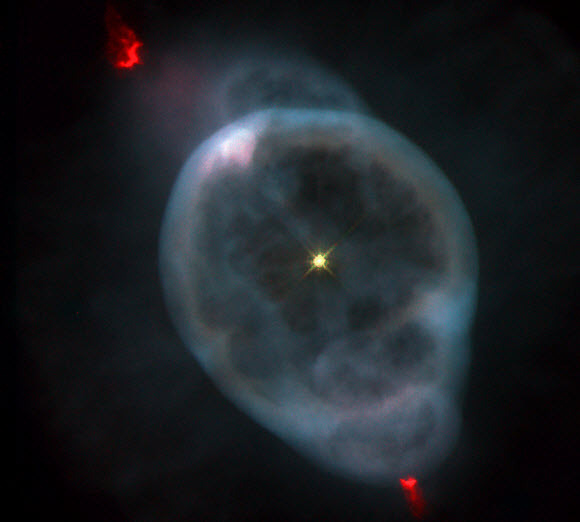 The nebula measures around two light years and contains a central white dwarf with an apparent magnitude of 11. The inner layers of the nebula were formed some 1,500 years ago The two ends of the nebula are marked by lobes of fast moving gas often tinted red in false-colour pictures. 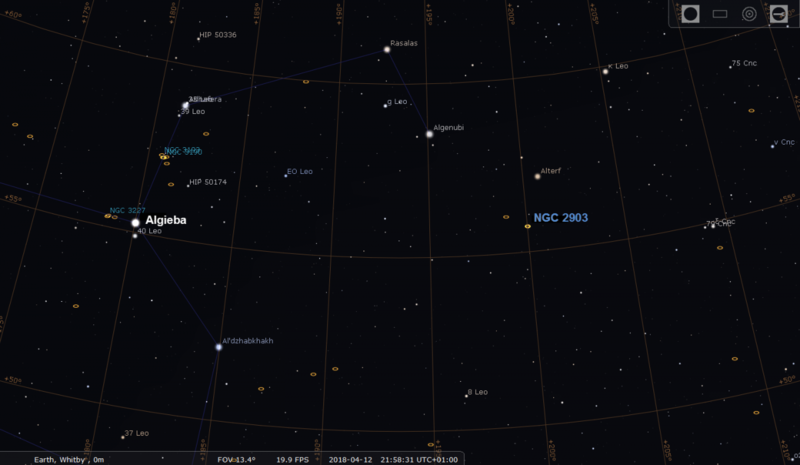 NGC 3242 can easily be observed with amateur telescopes, and appears bluish-green to most observers. Larger telescopes can distinguish the outer halo as well. 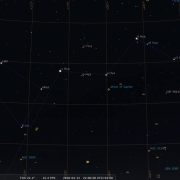 Look for it about 2 degrees southwest of the star μ (mu) Hydrae. 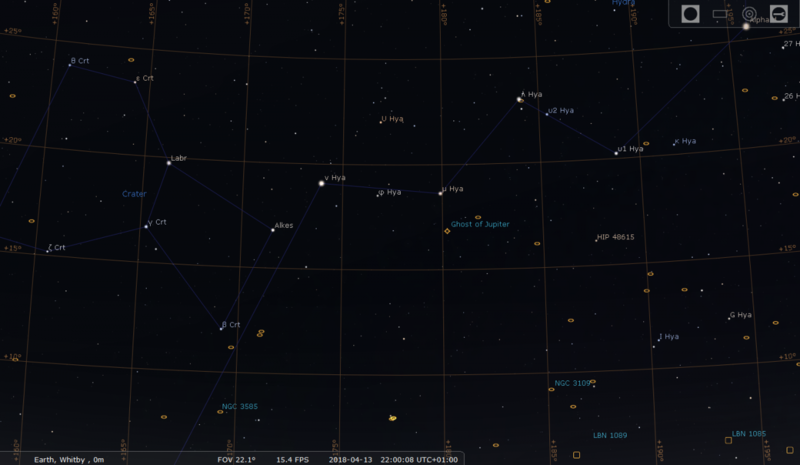 NGC 3242 crosses the meridian on the 13th at 22:00h (amongst other dates and times). Best viewed with at least 100mm aperture, medium power.